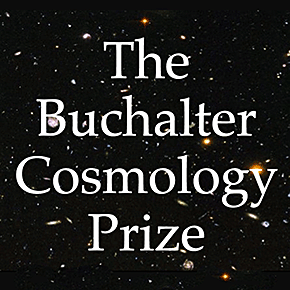 The mission of the Buchalter Cosmology Prize prize is to stimulate ground-breaking theoretical, observational, or experimental work, specifically around theories, observations, or methods, that challenge, extend, or illuminate current cosmological models and/or help explain the cosmic expansion from first principles. The ultimate goal is to help spur the formulation of a broader cosmological theory that explains current observations, puts forth testable new predictions, and fundamentally advances our understanding of physics. Submissions must be original and innovative work in cosmology that puts forth either new theories, new observations, or new methods that have the potential to produce a breakthrough advance beyond our present understanding of the standard cosmological model and currently-accepted paradigms. If a winning paper has multiple authors, the prize will be split equally among the authors.